Our Brothers from another Mother - Jason and Todd Alström of BeerAdvocate - are in the brewhouse with us today for our annual Extreme Beer Fest brew day! And this year, things are getting uniquely odd … yet semi-traditional. Today we’re brewing a semi-traditional Barleywine with an adventurous touch. Brewed with an estery yeast, dried cherries, sultana - big a$$ raisins - and dried black currants, this beer will be super malty and even more fruity. The inspiration? None other than Jason Alström’s Christmas Pudding recipe. To match this flavor profile, we kicked up the cake-like ingredients with hazelnut powder, toasted wheat and a British golden treacle. Basically, it’s the ultimate beer for the gluten gluttons of the world. This nameless beer - we promise there’s one coming! - will then be barrel-aged in used Port barrels for many months before premiering at Extreme Beer Fest on February 3 and 4, 2017. It will also go on tap at our Rehoboth brewpub at the same time. AND, that’s not all we’re up to today!!! 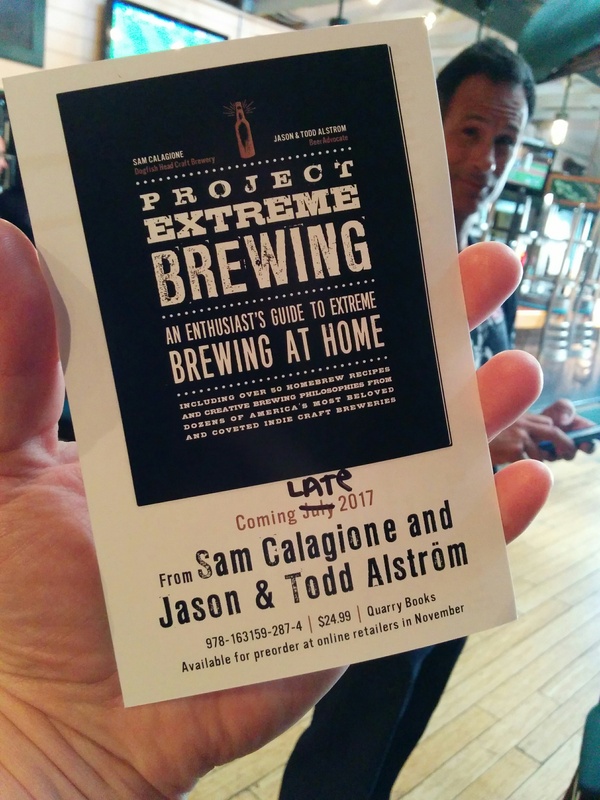 With Jason and Todd in town, what better time to announce the upcoming book collaboration between BeerAdvocate and Dogfish Head … Project Extreme Brewing: An Enthusiast's Guide to Extreme Brewing at Home. 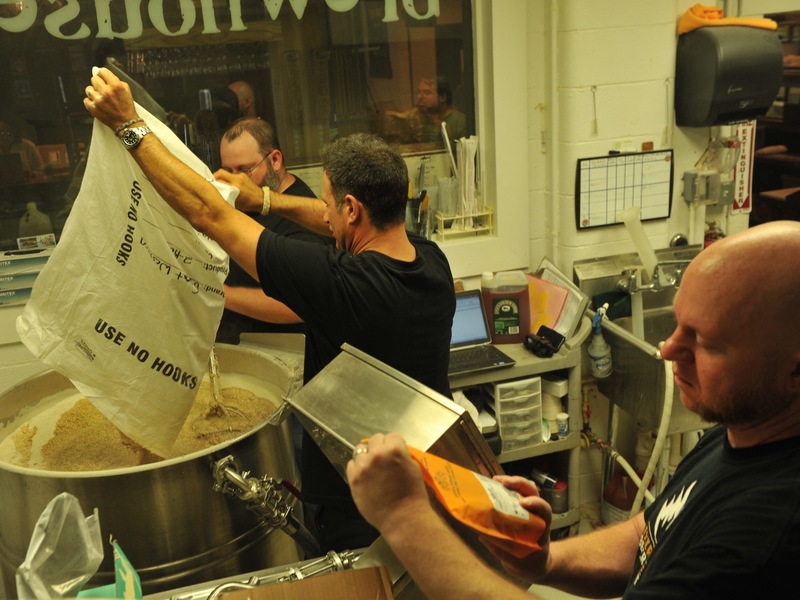 That’s right, the Brothers and Dogfish Head founder and president Sam Calagione have been curating the ultimate authoritative primer on extreme brewing for homebrewers! Inside this full color book, you'll explore more than 40 recipes for ambitious, boundary-pushing beers. And with tested five gallon recipes based on commercial releases, step-by-step instructions, and insider tips from 34 professional brewers, Project Extreme Brewing is required reading for any serious homebrewer. Nowhere else can you learn to make a Flanders Red inspired by a pastrami sandwich, a Stout with chocolate and oysters, a raspberry habanero Red Ale, or a Scotch Ale designed to mimic the flavors of an Old Fashioned cocktail. "In the last decade or so the homebrewing and commercial brewing community has grown to fully embrace the concept of beers without borders and brewing beyond militant beer styles. I have been proud to work shoulder-to-shoulder with the Alström Brothers at their Extreme Beer Fest throughout these years and now, with the help of many of our favorite brewers, we are pouring this shared love for experimental brewing into this DIY book,” says Sam. "What's extreme beer? Simply put, it's beer that pushes the boundaries of brewing. And the attitude, creativity, and techniques behind brewing extreme beers is the foundation of today's international brewing revolution. Project Extreme Brewing captures this and we're honored to be a part of it with Sam and the contributing brewers,” says Todd. Project Extreme Brewing will be available late 2017. We told you … extremely exciting!